Pierre Berton, Canada's most widely read historian, was born in the Yukon and educated at UBC. Author of forty-seven books, he has received three Governor General's awards for nonfiction, two Nellies for broadcasting, two National Newspaper awards, the Stephen Leacock Medal for Humour, and the National History Society's first award for "distinguished achievement in popularizing Canadian history." He holds eleven honorary degrees, is a member of the Newsman's Hall of Fame, and is a Companion of the Order of Canada. 1986-08-08. New. Ships with Tracking Number! INTERNATIONAL WORLDWIDE Shipping available. Buy with confidence, excellent customer service! Mcclelland And Stewart, 1972-01-01. 1st Reprint. Hardcover. Good. 2001-07-05. New. Ships with Tracking Number! INTERNATIONAL WORLDWIDE Shipping available. Buy with confidence, excellent customer service! McClelland & Stewart, 1986-09-06. Revised. Paperback. Used:Good. New York: Bernard Geis, 1967. 323 pp. Small nick to the edge of the rear cover.. First Edition. Hard Cover. Good/No Jacket. 8vo - over 7¾" - 9¾" tall. Toronoto, ON, Canada: McClelland & Stewart Limited, 1958 Signed by author on front endpaper. Photo illustrated innerboards. Spine is faded. Dust jacket is worn and chipped, now in a protective mylar covering. 457 indexed pages.. Signed by Author. 1st Edition. Hardcover. Good/Good. 6"x8.5". McClelland and Stewart. Very Good in Fair dust jacket. 1958. First Edition; First Printing. Hardcover. A Good Read ships from Toronto and Niagara Falls, NY - customers outside of North America please allow two to three weeks for delivery. Heavy rubbing on edges of gold d/j. Chipping to spine ends. Inscribed by the author on ffep: "To all the Marshalls from all the Bertons, Christmas 1958". Author has also signed on title page. ; Signed by Author . McClelland & Stewart. PAPERBACK. 0771012845 NEW ~ Tight & Bright ~ We Ship within 24 Hours + FREE Tracking, answer emails fast, accept returns & work hard to deliver 100% customer satisfaction! . New. Toronto: McClelland & Stewart [copyright date 1958, 1961], later printings. (Hardcover boxed set) 457, xix, 231pp. Very good. In very good slipcase. Illustrated endpapers, maps, bibliography, photographs, index. The spines are darkened. Previous owner's labels, the back of the slipcase is faded. Includes Laure Beatrice Berton (I Married the Klondike) & Pierre Berton (Klondike; the Life and Death of the Last Great Gold Rush). Preface by Robert Service. (Western Canada). Toronto: Mcclelland & Stewart. Very Good. 1961. Hardcover. Inscribed by the Author on the front free endpaper. Brown cloth with gilt stamping, 455 pages, plus an index. Very Good in a slightly edge chipped but nice dust jacket. .
McClelland & Stewart. PAPERBACK. 0771012845 New Condition. . New. McClelland & Stewart. Hardcover. 0771012837 New Condition. . New. Anchor Canada. PAPERBACK. 0385658443 New Condition. . New. McClelland & Stewart, 1972-01-01. 2nd Rev. Hardcover. VG/VG+. A brief gift inscription to the front endpaper, no other marks. Clean hardcover in green leatherette with gilt spine lettering, blindstamped axe design to front cover, endpapers illustrated with portraits of major characters of the narrative; square binding and corners. Matching green covered slipcase with gilt rectangle design front and back, with very little wear. Toronto: McClelland & Stewart, 1972. Revised edition with a new preface by the author. xxiii, 472 pages; illustrated. - - Wrapped, boxed and promptly shipped with tracking provided. 1972-02-07. Good. Ships with Tracking Number! INTERNATIONAL WORLDWIDE Shipping available. May not contain Access Codes or Supplements. May be ex-library. Shipping & Handling by region. Buy with confidence, excellent customer service! 1986-08-08. Good. Ships with Tracking Number! INTERNATIONAL WORLDWIDE Shipping available. May not contain Access Codes or Supplements. May be ex-library. Shipping & Handling by region. Buy with confidence, excellent customer service! Klondike - The Last Great Gold Rush 1896-1899. Ontario, : McClelland and Stewart, , 1985. Revised Edition. [Ninth Printing of the 1972 Edition].. Near Fine condition with only minor signs of external wear. Name on titlepage erased.. Revised Edition. [Ninth Printing of the 1972 Edition]. Ontario, McClelland and Stewart, 1985. Octavo. XXIII, 472 pages. Original Hardcover with illustrated dustjacket in protective Mylar. Near Fine condition with only minor signs of external wear. Name on titlepage erased. Condition: Near Fine condition with only minor signs of external wear. Name on titlepage erased. Edition: Revised Edition. [Ninth Printing of the 1972 Edition]. Anchor Canada. PAPERBACK. 0385658443 Looks close to brand new! Shiny cover and clean tight pages. Nice. . Fine. Toronto, On: McClelland and Stewart Limited [0-7710-1283-7] 1972. (hardcover) 472pp. Very good, no dust jacket. 8vo. Scarce in box. May be a presentation copy. Inscription to Title page.Olive boards with gold font. Front cover is embossed with pick-axe graphic. Ills. E.p. Clean, tight and bright throughout. Box has a faint mark on one face..
Anchor Canada, 2001-10-09. Revised. Paperback. Used:Good. Penguin, 1972. Mass-market paperback. New. has some page tanning. 590 p. Trade paperback (US). Glued binding. Toronto: McClelland & Stewart, 1958. Hard bound, first edition, illustrated endpapers, signed by author on bottom of front free endpaper with Winnipeg writer Ann Henry's signature at top. Very good/-- (no dust jacket). 650 grams. All books in stock and available for immediate shipment from Winnipeg, Manitoba. Anchor Canada. PAPERBACK. 0385658443 Like New Condition. . Fine. McClelland & Stewart. Hardcover. 0771012837 Like New Condition. . Fine. McClelland & Stewart. PAPERBACK. 0771012845 Like New Condition. . Fine. KLONDIKE: The Last Great Gold Rush, 1896-1899. Toronto:: McClelland & Stewart,, (1978). Very good+ in very good dust jacket.. Revised edition. A dramatic account of this gold rush -one which took place under incredibly difficult circumstances - and the events leading up to it, by an author whose father was one of those goldseekers, and who was born and lived in the Yukon. Originally published in 1958. This edition includes a new preface in which he compares the US and Canada frontier attitudes and development. Maps. Bibliography and Note on Sources.Index. xxiii, 472 pp. Photographic endpapers. Condition: Very good+ in very good dust jacket. McClelland & Stewart. Used - Good. Former Library book. Shows some signs of wear, and may have some markings on the inside. McClelland & Stewart, 1961. Later Printing. Hardcover. . Very good condition./Very good lightly edgeworn dust jacket. . Signed by author. Book is as described - all defects and marks are noted. A very nice copy. Toronto: McClelland & Stewart, 1974. Second Edition, Revised, 2nd Printing. Original Cloth. Fine/Very Good. McClelland & Stewart, 1972. Hardcover. Good. Disclaimer:A copy that has been read, but remains in clean condition. All pages are intact, and the cover is intact. The spine may show signs of wear. Pages can include limited notes and highlighting, and the copy can include previous owner inscriptions. At ThriftBooks, our motto is: Read More, Spend Less.Sixth printing. SIGNED by the author. Shelf and handling wear to cover and binding, with general signs of previous use. Binding is sound. Pages are intact and free of marks. Secure packaging for safe delivery.Dust jacket quality is not guaranteed. Toronto: McClelland and Stewart, 1958. (xxiii) 472 pp. Brown cloth lettered in gilt on the spine; illustrated endpapers; illustrated with maps. Wear at the corners of the dustjacket with a few nicks and short tears around the edges; no interior markings. The Contents are: Prelude: Beyond That Last Blue Mountain; Of a Fateful Encounter; How Dawson Was Born; Of Treasure Ships Laded with Gold; Being the Tale of the Dead Horse Trail; A Chapter of Paradoxes; A Chapter of Deceptions; An Unbroken Line of Men; How Thirty Thousand Souls Were Conveyed Safely; How Dawson City Was Transformed; Being a Faithful Account of Jefferson Randolph Soapy Smith; and Nourished by Gold; followed by an index.. Eighth Printing. Hardcover. Very Good/Very Good-. 8vo. London: W. H. Allen. Very Good+ in Good dust jacket. 1960. 1st UK. Hardcover. Price clipped DJ chipped with light delamination, short tears & some creasing. Light yellowing of pages ; DJ in Mylar, bright, solid book ; 8vo 8" - 9" tall; 456 + index pages; A classic Canadian history by someone who spent his first 12 years in Dawson City. Berton was born there after the big rush and was imbued with the history of the place by his parents, especially by his mother, Laura Beatrice Berton, who wrote the biographical classic 'I Married the Klondike'. .
Toronto & London: McClelland & Stewart Ltd, 1987. Revised Edition Eleventh Printing . Paperback. Very Good/No Jacket. 8vo - over 7¾" - 9¾" tall. Very good gold trade paperback. Light use, creasing. (1987), 8vo, xxiii, , 472pp. SPADONI & DONNELLY 2336, Lowther 1996 Bibliography pages 439-451, "To the original volume Mr. Berton has added close to twenty thousand words of new material in the form of a preface comparing and contrasting American and Canadian frontier styles and myths and more than fifty additions to the main body of the text." US: McClelland & Stewart, 1986. McClelland & Stewart 1986 Very Good/ Light wear to bright glossy cover, tight unmarked pages. In Plastic.. Paperback. Very Good. NEW YORK CITY: KNOPF, 1959. Hardcover. Very Good/Very Good. 8vo - over 7¾ - 9¾" tall. Signed by Author on Flypage-Book is published by Knopf- Dust Jacket states McClelland Stewart- Edge wear on DJ-Book store label on flypage-In 1897 a grimy steamer docked in Seattle and set into epic motion the incredible succession of events that Pierre Berton's exhilarating The Klondike Fever chronicles in all its splendid and astonishing folly. For the steamer Portland bore two tons of pure Klondike gold. And immediately, the stampede north to Alaska began. Easily as many as 100,000 adventurers, dreamers, and would-be miners from all over the world struck out for the remote, isolated gold fields in the Klondike Valley, most of them in total ignorance of the long, harsh Alaskan winters and the territory's indomitable terrain. Less than a third of that number would complete the enormously arduous mountain journey to their destination. Some would strike gold. Berton's story belongs less to the few who would make their fortunes than to the many swept up in the gold mania, to often unfortunate effects and tragic ends. It is a story of cold skies and avalanches, of con men and gamblers and dance hall girls, of sunken ships, of suicides, of dead horses and desperate men, of grizzly old miners and millionaires, of the land - its exploitation and revenge. It is a story of the human capacity to dream, and to endure. McClelland & Stewart Inc, 1972. Revised Edition. Hardcover. Very Good / Fair Dustjacket. 472 pages, 6.5" x 9.75". Ownership inscription on ffep, bumped corners, otherwise a clean and tight copy. Originally published in 1958. This edition includes a new preface in which he compares the US and Canada frontier attitudes and development. Maps, Bibliography and Note on Sources, Index. 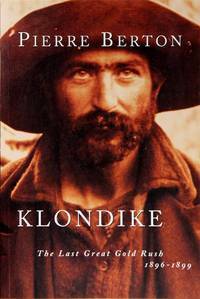 Klondike : The Life and Death of the Last Great Gold Rush. Toronto: McClelland & Stewart, 1967. viii, 457, xix, (2) pp. Later printing. Very good condition in dust jacket. Seller: Ten Pound Island Book Co.
Anchor Canada, October 2001. Trade Paperback . Used Good. This is the Revised edition. Text is in English. Size - H: 9', W: 6', D: 1.25' This item is Used and is listed as being in Very Good condition. Cover clean and undamaged. Spine is intact and tight. Pages are clean and unmarked. Pages 409-420 are lightly bumped near the top. This item is in excellent condition. FF00000004726 We carry new and used books in our storefront. We want you to be satisfied with your purchase. Please contact us if you have questions regarding this item. Toronto: McClelland and Stewart, 1967. Tenth printing. Hardcover. Fine Condition. Anchor Canada, 2001. Revised edition.. Softcover. NF..
Canada: McClelland & Stewart, 1972. 2nd Edition . Hardcover. Fine/Very Good. Used, hardcover, 2nd edition, 1972. Condition: fine, jacket: very good. Jacket has some fraying on its edges. TORONTO, ONTARIO: MCCLELLAND AND STEWART. G+ IN BROWN CLOTH WITH GILT TRIM. NO DJ. LIGHT WEAR. Pages: 457+. . 1958. 1ST EDITION. HARDCOVER.. BOARDS LIGHTLY SUNNED. PREV. OWNER NAME INKED OUT FFEP. PAGES CLEAN, BINDING TIGHT. GOOD READING COPY. . Condition: G+ IN BROWN CLOTH WITH GILT TRIM. NO DJ. LIGHT WEAR. Pages: 457+.